Many Of You May Know About The Leading Brand “Richfeel” As I already Two Products Sent By The Brand Earlier . For Those Who Don’t Know The Brand . Please Read Carefully . It Comes in a 50gm Plastic Round Tub . It’s a Cream based which removes dirt, stale Makeup & skin secretions by penetrating deep into the skin. Begin your facial by Massaging the face with this Cleanser & remove it with a damp cotton ball . It Also Comes in a 50gm Plastic Round Tub. It’s a Cream based Scrub with Walnut Shells , smells Amazingly Awesome. Massage the face with this scrub In circular motions & leave it on for 5 minutes . After Rinse the face With cold water . It helps in removing all Stubborn dirt , whiteheads & blackheads. Give steam to face for 5 to 7 minutes & Pat Dry With Soft Facial Muslin Towel . It Also Comes in a 50gm Plastic Round Tub. ITS a Green Coloured Gel & Gives a soothing effect to the Skin . Apply this gel immediately to the face after the steam to rehydrate the skin. & Massage for 5 to 7 minutes. Take off the excess gel from the skin with damp cotton ball after . It Also Comes in a 50gm Plastic Round Tub. Massage the face with this rich facial Massage cream for about 10-15 minutes to add nourishment & Glow to the skin. For Better Results we can Add 2-3 drops of any lotion or Moisturiser to the Massage Cream . It’s Clay Powder based Facial pack which Also Comes in a 50gm Plastic Round Tub. Take the required amount according to your facial skin & mix it with some clean water or any floral water to make the thick consistency paste . Apply it all over the face & neck . Leave it on for 15 minutes . Wash it off with Cold water . Finish It Off By Spritzing Some Facial Mist & Enjoy the Clean , Moisturised & Brightening Skin ..
1) Perform a Patch Test before applying directly to the skin. 2) Avoid Contact with eyes . 1)Store In a cool / Dry Place. 2) Close The Cap properly After Every use . 3) Best Before 2 years from the date of manufacturing. The Packaging Looks like this. Please Refer the image Above . CONTAINS 5 units of 50gms each. Do not buy individually without outer carton. It Retails For Rs. 1399/- . As This Facial Kit Is Suitable for All Skin types, I really find this one a perfect kit to choose from coz it neither leaves my Skin Dry nor greasy or Oily . It maintains the pH level of my skin & Gives the Moisturisation needed . It’s Perfect treat to some Indulgence for your skin . It’s Suitable for every season . I really loved it & Will recommend this to all . So A Five Star Rating from Myside ⭐⭐⭐⭐⭐. Do try it & feel the difference.. .. They Guys have awesome Range of Beauty products to choose from .. I’m Sure You Loved it and will thank me later ?? Do Like This Post & comment ,, I wanted you to share your thoughts as well !! Thanks For Reading & Stay Connected !! wow this is amazing..will try for sure .. Thank you. 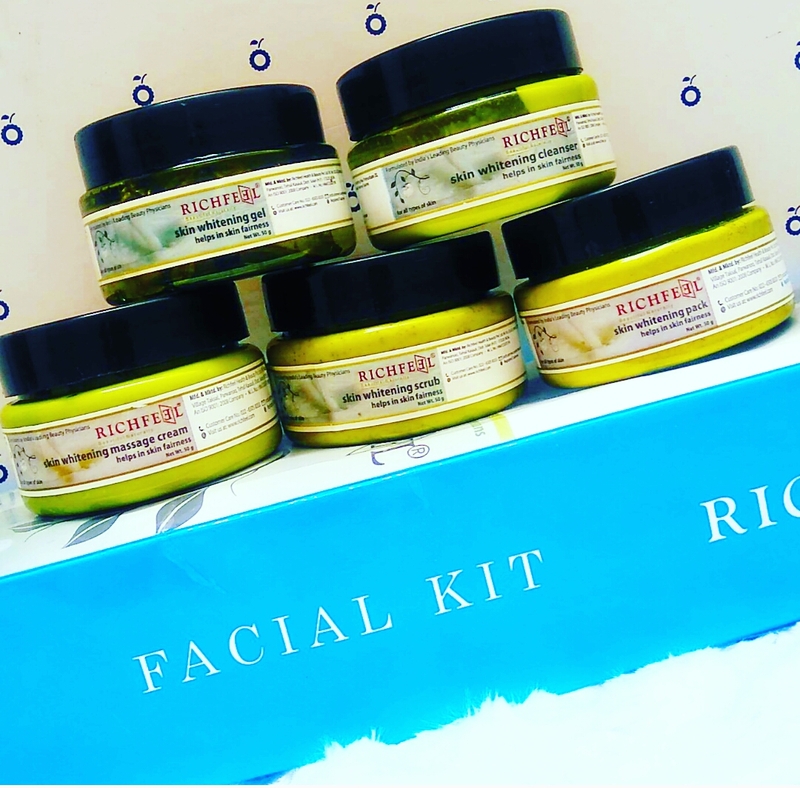 Do give it a try..
Thx for Reading , Do try ..
Richfeel k products ka sabhi review bahut accha hai ?? Ye to bahut badiya hai self pampering k liye ? wish list me likh liya, recent kit khatam hony per yehi leti hu ? I want to know the ingredients in this. It looks interesting and useful.I have sensitive skin so it’s a problem. Yeah will share the ingredients with you. I have tanned so much in the past few months I think I could use this ! Yeah dear do give it a try ! If it doesn’t make skin oily then I would love to try this facial for sure. No Not A Bit , it keeps your skin normal .